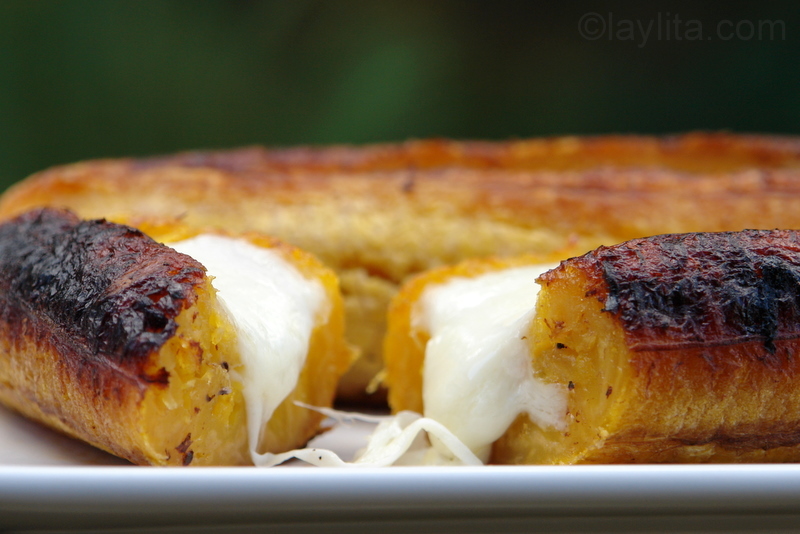 Who can resist these delicious baked ripe plantains stuffed with cheese? One thing you may have noticed about Ecuadorian food – and Latin food in general – is that there is a lot of frying going on. There are a lot of healthy options also, but yes a lot of things are fried, which can be very tasty and is fine as long as there is a balance. My mom was always concerned about keeping us healthy when we growing up and was very focused on healthy food, so she tried a lot of different ways to prepare foods that were typically fried and either bake them and/or use less grease. We loved having fried ripe plantains with cheese for breakfast, but sometimes my mom would bake them instead, and they were just as good. She would rub a little bit of butter or oil on the plantains, bake them and then stuff them with cheese – or for a quicker version you can slice the plantains, bake them and then sprinkle grated cheese on top. 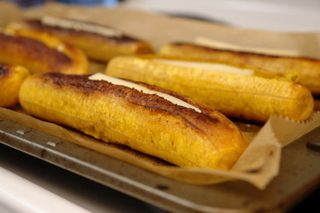 Easy recipe for homemade baked ripe plantains stuffed with cheese. These baked ripe plantains with cheese are great for breakfast or brunch. You can eat a whole one or cut in half or smaller pieces to serve as appetizers or as a side dish. 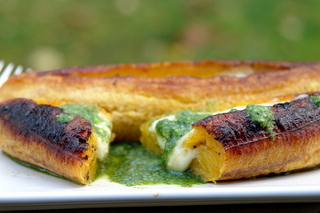 I love to eat these baked ripe plantains with aji criollo, a spicy Ecuadorian hot sauce, the combination of sweet plantain, melted gooey cheese and spicy cilantro hot sauce is just perfect. So, if you love plantains but want to try a healthier alternative to frying ripe plantains, or just want to try a new twist on them you should give these a try. Thanks for all the recipes you share! My family and I are currently living outside of Quito and I’ve used your blog a lot especially when I’m preparing snacks for my daughter’s school! She attends an Ecuadorian preschool and I have to prepare a lot of typical foods that I’ve never done before! Thanks for all your help and deliciousness!!! For all you Seattleites: Sometimes the market (Pike Place) carries plantains, but only seasonally that I’ve found. I regularly find them at Uwajimaya, the large Asian market in the International District. They sell plantains at QFC, Metropolitian Market, Whole Foods. They are easy to find. I LOVE these! I’m from ecuador too, and the best type of cheese to use is a salty cheese. Mozzarella is good, but try going to the store and look for “Queso blanco” aka white cheese, it works awesome. WOW! Este plato me recuerda de Nicaragua…lo hacen esto alla. Que Rico amiga y gracias por la receta y los recuerdos!!! YUMMY!!! Siiiiii, Este plato me recuerda a mi mama en Colombia!! Ellas tambien los prepara asi con queso tal cual los tienes en las fotos… hoy intente hacerlos aca en Melbourne Australia, por que gracias a Dios encontre unos platanos en el market pero no me quedaron igual a los de mi mami… creo que estan muy maduritos y blanditos!! Anyway thanks for the recipe,, I didn’t call my mum for asking because I found the recipe in your website! thanks! gracias por compartir recetas de nuestras tierras!! Olga en que mercado los conseguiste?? me muero por hacer unos patacones. Yum! I’ve never tried making plantains at home! 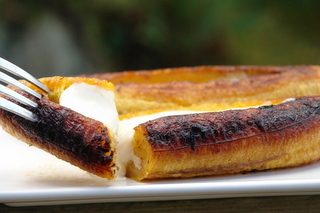 I love plantains, I had them also with a slice of guava to melt with the cheese and it becomes an amazing dessert. I love all your recipes. I had these in Guattemala and you have to eat them with Cream Cheese! The Best!! Just made these and the aji- absolutely delicious. I used plantains that were almost completely black with maybe 15-20% yellow spots and serrano chiles for the aji. If you like garlic-y hot sauce, you will want to make extra criollo to use on other stuff. Thanks so much for this delicious and relatively easy recipe. In Mexico I learned to cut ripe plantains into long slices, fry them, sprinkle with sugar and drizzle with fresh, thickened cream. I can’t always find the right cream in the U.S., so I now mix sour cream with turbinado sugar and drizzle them with that. Mexican cream is called crema fresca and is closer to creme fraiche than sour cream. You can buy it online. looks delicious! i’m definitely going to try it:) thanks for sharing! Hi! This is about the 5th time I have made thesse platanos. I love them like this. My dad always just fried up slices, but he never baked them and stuffed them with cheese! I love it. Ay Dios mio, platanos?!?!!?!?!?!?!!?!?!? con queso?!?!?! que delicia!!!!!!!!! Back in Colombia, we would literally be eating them daily. Your recipes pictures look so delicious, especially these ones. When I buy green plantains I put them in a paper bag, place them in a dark cool place and let them ripe, ussually in about a week they are yummilly ripe and ready, (when the skin is dark). Before I serve them, I sprinkle a lil bit of cinnamon powder. This is the best… is a really delicious..! These were amazing! I tried the queso fresco option and it was very tasty. What a great brunch dish! The website is wonderful, thank you for putting up these great recipes, I can finally have something new to cook for my grandmother, who although may know everything there is to know about Peruvian food, will hopefully find something refreshing about these new dishes. I happen to be dating a native of Quito for the past year (June 16…so sad I know that) anyway, I’m American-Southern-I knew very little about his culture (Galapagos? Really? Rain Forest? Really? Will I stand out there? Do they even have black people-yes, I’m famous for my quotes), even less about his food but I found you and this website and how excellent it is. You should have seen my face when on our first date he told me his favorite food (I’m a foodie) was soup–he was this close to not getting a second date (soup, before I found this site, I thought was like hospice food). I learned its a culture thing and soup is not just soup-it’s intense! I just tried a modified version of these that replaced the cilantro sauce with roasted poblano peppers and they were pretty yummy. Next time, I’d definitely go for queso blanco, though. I agree with the commenter who wanted a bit more of that salty flavor. 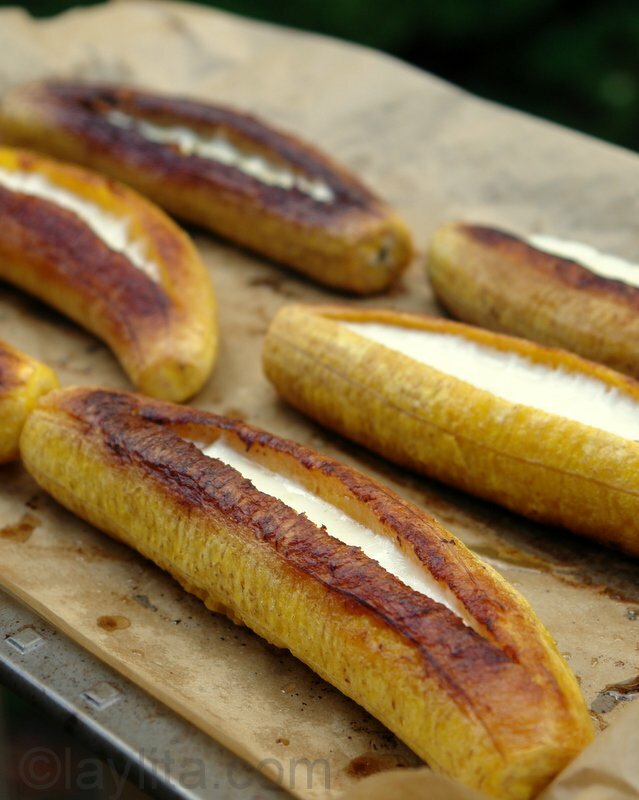 i need to get my hands on some plantains soon so i can try these. I found your website because I searched Ecuadorian Recipes. I love it!!! I feels great to see that I am not the only one that loves Ecuadorina Food. Maybe some time in the near future you will post one? I have the muchines on my list of recipes to make and post (I just don’t seem to have much time these days, but eventually I will get that recipe posted). I landed up on your site searching for Empanadas. You have a wonderful site with beautiful pictures. I am from Seattle too. 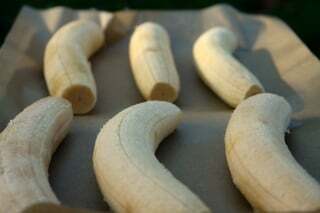 I have lots of bananas at home which my husband stored them for the snow storm. I have a New Year party at home and I am going to try them. Looks very good to me. Oh yeah I almost forgot that if you can’t find a Latino store where they may have them. Asian stores usually have them as well. The best way to ripen plantains is to put them in a paper bag, and place them in a dry, dark place such as a cupboard. It usually takes about half the time. It works quite well for avocados, papayas and bananas. Old trick from Manabi, Ecuador. For the avocados it works quite well if you wrap them in newspapers individually. Another great way to eat them with, if you are able to get it, is with “salprieta” roasted peanuts and maize, pepper, garlic, achiote and salt. 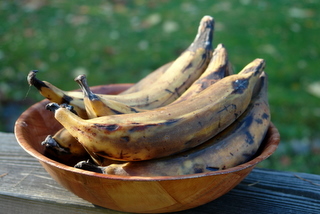 Another healthy way to eat ripe plantain is to boil them. It makes a great breakfast when paired with goat cheese and honey. I am kind of hesitant about giving out this recipe but I am an aspiring cook/chef so I want to share. There is no such thing as an over ripped plantain, they are great at any stage. This recipe works quite well when their peel is almost fully black. Boil them until they are almost mushy, but not falling apart. At the same time add a couple of cinnamon sticks. Pull them out and serve them with goat feta or goat cream cheese. On top of it a drizzle of honey and enjoy. 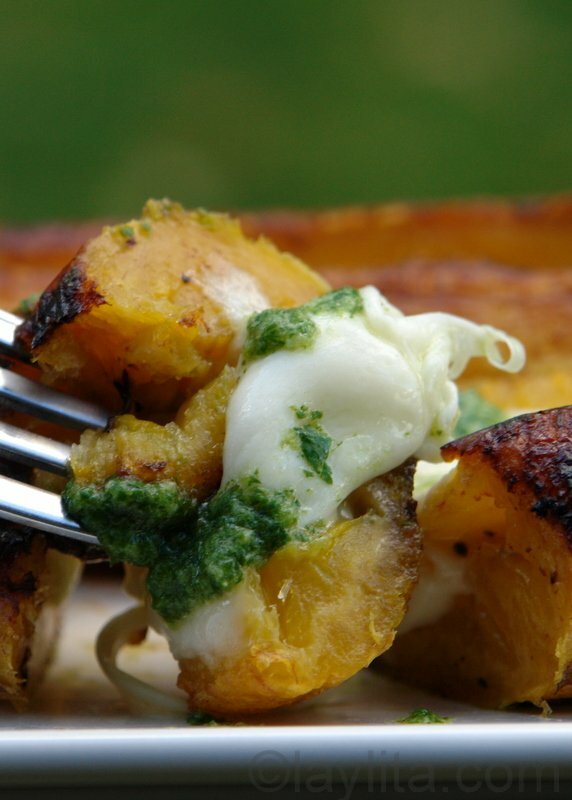 A great way to use green plantain is to grate them into soups. When cooking lentils or chick peas grate them into them, along with a drizzle of “achiote”. It gives them quite a nice flavour. I hope you all enjoy it. 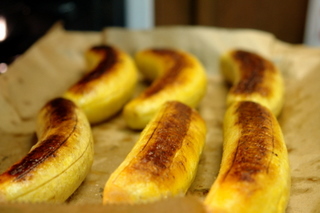 Plantains are such a delicious snack, I really enjoy them with cinnamon :). I like how you made them savory here, though, with the cheese. They’d make a delicious appetizer or tasty side! Layla, this mozarella plantain just looks wonderful! Wow! That looks so tasty! 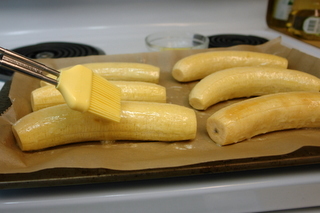 If I ever get hold of some plantains, I’ll definitely be baking them with cheese! That looks fantastic! I’m bookmarking this – can’t wait to try it! Hmmm, I’ve never had bananas with cheese. Looks like an interesting combo, maybe I’ll give it a try some time. It looks great! I don’t know why I didn’t think of cheese with plantains before. Great combo! Nice food photography. Those plantains look absolutely amazing. I will definitely give your recipe a try. Oh, and your photos are equally wonderful. Thanks for sharing! I just came across this blog not to long ago and I LOVE IT!!!! I cannot wait to make endless meals off this blog. Seriously, cannot wait! Amazing!! My cousins in Panama eat these, but slices with cheese! Soo good! Yours look amazing! By the way, I LOVE your blog. Ay Dios Mio, that looks incredible! Great post! Great photos! Fat and limited green vegetables is a concern of mine too with Latin cuisine. I don’t know if this recipe really lowers the fat content because although you bake rather than fry, you then add cheese and the sauce. HOWEVER, this looks so good, I can’t wait to try it! Love it! Oh. My. God! You’ve made me a happy woman with this recipe. I can’t wait to try it. In Africa, I used to eat roasted plantain with roasted peanuts, but I’ve never had plantains with cheese. Thank you! Interesting! A delicious looking dish! Thanks for the information about options for queso and where to buy plantain. I didn’t know I can find that type of cheese at the Pike Place market, I definitely have to try that Samish Bay queso fresco cheese and the Froylan. I have been searching for that type of cheese for a long time. I love plantain with passion, my mom used to made them for me all the time. 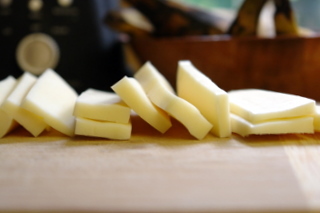 I eat them fried, boiled, and baked… I like plantains with hard queso blanco but I have never found anything similar in here, so I use monterrey jack when I make them. I will try mozzarela next time however I like the salty taste of the latin american white cheese. I wonder if Feta cheese can get me the salty flavor. Where do you usually buy the plantains? QFC has them sometimes but they are always so green and feel it takes forever for them to get ripe. Any tips? Feta cheese works well for the salty flavor contrast with the sweet plantains, I also recently found a really good queso (one of the best I’ve had out of Ecuador) it is called Froylan and is actually made in Oregon (so not to far). Also, I found an amazing fresh cheese, the closest to quesillo, at the farmer’s market, it is made by Samish Bay Cheese, a little bit on the pricey side but so worth it. There are few places that I buy plantains: the Latino Market store at Pike Place Market, also La Espanola on 13433 NE 20th St in Bellevue, also La Tienda on 1506 145th Pl SE in Bellevue – this last place usually has a good selection of green, semi-ripe, ripe and very ripe plantains, they told me the plantains are delivered on Thursdays so that is the best day to go. I’ve been told there are more latin groceries stores in Renton and Kent but I haven’t had a chance to check them out yet. I have had no luck cooking plantains. I love the crispy plantain chips at El Camino but besides that, I just havent been able to recreate anything that is good:( These look amazing though with the mozzarella! Yum. Those look good, very very good. 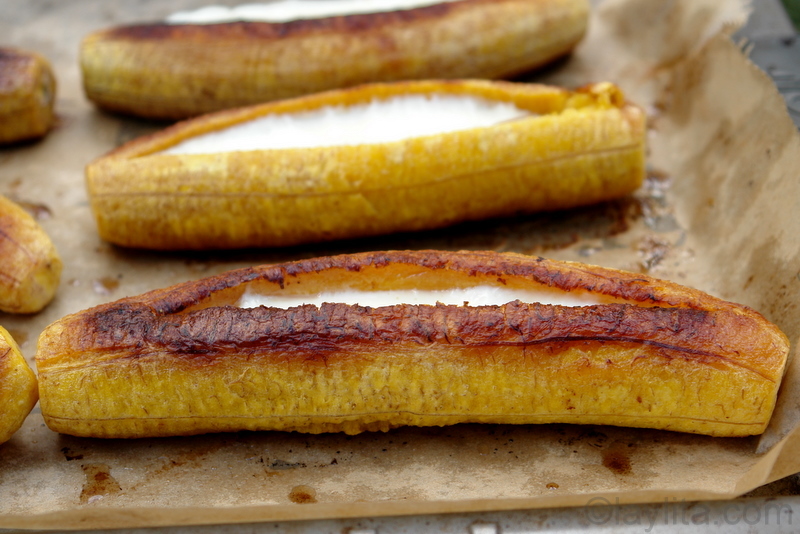 I think I will make these just as soon as I can get the plantains.